The surge of bank loans in the first quarter leaves little room for any doubt now about China's capacity to revive its economy with a liquidity flood. According to the People's Bank of China, the country's new lending increased by a record 1.89 trillion yuan ($276 billion) in March, pushing the total for the first three months to a jaw-dropping 4.58 trillion yuan. The authorities have explicitly made moderately loose monetary policy a key part of the country's efforts to fight economic downturn. The central government announced a target of at least 5 trillion yuan of new loans this year. By granting within a quarter new loans close to the largest sum of what they have lent for a whole year, domestic banks have obviously embraced the counter-crisis policy more enthusiastically than what the government anticipated. Yet, as the sustainability of this credit boom remains open to question, there is no hurry for policymakers to take an early recovery for granted. Despite emerging evidence that the Chinese economy might have bottomed, policymakers need to be highly alert to the danger of both too much lending today that leads to numerous bad loans tomorrow and a premature tightening of credit that can preclude the expected economic turnaround. A considerable easing of credit is essential for the Chinese economy to pick up steam after it was hit hard by the global crisis. But the monetary authorities must not do more than what is needed in reflating the economy. Given the explosion in credit since the central bank dropped lending restrictions last November, it is high time to raise the hard question of whether the lenders have managed their risks as well as before. An excessive concentration of loans in infrastructure projects can pose a potential hazard for banks. Unusual growth in discounted bills is also suspicious because some of them may have found their way into the property market or the stock market to inflate asset prices. Some domestic bankers insist that their unprecedented credit expansion is market-driven. In other words, they have performed due diligence during this credit boom. However, a bitter lesson of the current global financial crisis is that regulators should not believe that bankers themselves will fully take care of all the risks for the sake of their own interest. 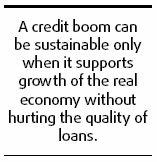 A credit boom can be sustainable only when it supports growth of the real economy without hurting the quality of loans. Unfortunately, new loans seem to have grown too much for the economy to absorb and too fast for the banks to assess.